Microlissencephaly in a 27 WG (week of gestation) foetus with TUBB2B mutation. Macroscopical view of the left hemisphere showing agyria, absent sylvian fissure and absent olfactory bulb. Microlissencephaly (MLIS) is a rare congenital brain disorder that combines severe microcephaly (small head) with lissencephaly (smooth brain surface due to absent sulci and gyri). Microlissencephaly is a heterogeneous disorder i.e. it has many different causes and a variable clinical course. 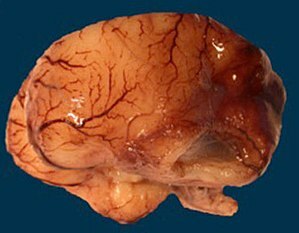 Microlissencephaly is a malformation of cortical development (MCD) that occurs due to failure of neuronal migration between the third and fifth month of gestation as well as stem cell population abnormalities. Numerous genes have been found to be associated with microlissencephaly, however, the pathophysiology is still not completely understood. The combination of lissencephaly with severe congenital microcephaly is designated as microlissencephaly only when the cortex is abnormally thick. If such combination exists with a normal cortical thickness (2.5 to 3 mm), it is known as "microcephaly with simplified gyral pattern" (MSGP). Both MLIS and MSGP have a much more severe clinical course than microcephaly alone. They are inherited in autosomal recessive manner. Prior to 2000, the term “microlissencephaly” was used to designate both MLIS and MSGP. Microlissencephaly Type A or Norman-Roberts syndrome (NRS): a microlissencephaly with thick cortex without infratentorial anomalies. Other clinical features may include: a bitemporal narrowing, a broad nasal root. There is postnatal growth retardation, severe mental retardation associated with pyramidal spasticity and epilepsy. This entity could be identical to "lissencephaly with cerebellar hypoplasia type B" (LCHb), and therefore linked to mutations in RELN gene. Microlissencephaly Type B or Barth microlissencephaly syndrome: is a microlissencephaly with thick cortex, severe cerebellar and brainstem hypoplasia. The Barth-type of MLIS is the most severe of all the known lissencephaly syndromes. This phenotype consists of polyhydramnios (probably due to poor fetal swallowing), severe congenital microcephaly, weak respiratory effort, and survival for only a few hours or days. Barth described two siblings with this type as having a very low brainweight, wide ventricles, a very thin neopallium, absent corpus callosum and absent olfactory nerve. MRI of a patient with TUBA1A mutation shows microlissencephaly with cerebellar hypoplasia. a. smooth brain surface (arrow) b. absent corpus callosum (arrow). Microlissencephalic patients suffer from spasticity, seizures, severe developmental delay and intellectual disabilities with survival varying from days to years. Patients may also have dysmorphic craniofacial features, abnormal genitalia, and arthrogryposis. Microlissencephaly may arise as a part of Baraitser-Winter syndrome which comprises also ptosis, coloboma, hearing loss and learning disability. Moreover, it is the distinct developmental brain abnormality in "microcephalic osteodysplastic primordial dwarfism" (MOPD1). Microlissencephaly may be accompanied by micromelia as in Basel-Vanagaite-Sirota syndrome (a.k.a. Microlissencephaly-Micromelia syndrome). The genetic basis and pathophysiology of microlissencephaly are still not completely understood. Most cases of microlissencephaly are described in consanguineous families suggesting an autosomal recessive inheritance. Mutation of RELN gene or CIT could cause MLIS. Human NDE1 mutations and mouse Nde1 loss lead to cortical lamination deficits, which, together with reduced neuronal production cause microlissencephaly. Homozygous frameshift mutations in NDE1 gene was found to cause microlissencephaly with up to 90% reduction in brain mass and seizures starting early in life. Some other disease-causing genes include: KATNB1 and WDR62. It is hypothesized that the KATNB1-associated microlissencephaly is the result of a combined effect of reduced neural progenitor populations and impaired interaction between the Katanin P80 subunit (encoded by KATNB1) and LIS1 (a.k.a. PAFAH1B1), a protein mutated in type 1 lissencephaly. Missense mutation in ACTG1 gene was identified in three cases of microlissencephaly. ACTG1 is the same gene that, when mutated, causes Baraitser-Winter syndrome. A loss-of-function mutation in the Doublesex- and Mab-3–Related Transcription factor A2 (DMRTA2, also known as DMRT5) gene has been reported in a case of microlissencephaly, implicating DMRTA2 as a critical regulator of cortical neural progenitor cell dynamics. Microlissencepahly is considered a tubulinopathy (tubulin gene defect) i.e. is caused by mutation in tubulin genes, mainly TUBA1A and less commonly TUBB2B, TUBB3, TUBA3E and TUBG1. Central pachygyria, polymicrogyria are more commonly seen in patients with defects in TUBB2B, TUBB3, and TUBB5. This implys the critical role of microtubule cytoskeleton in the pathophysiology of microlissencephaly as well as other neuronal migration disorders. Congenital infections like cytomegalovirus are also known to cause microlissencephaly. Both microlissencephaly and microcephaly with simplified gyral pattern result from either decreased stem cell proliferation or increased apoptosis in the germinal zone of the cerebral cortex. Microlissencephaly can be diagnosed by prenatal MRI. MRI is better than ultrasound when it comes to detecting microlissencephaly or MSGP prenatally. The ideal time for proper prenatal diagnosis is between the 34th and 35th gestational week which is the time when the secondary gyration normally terminates. In microlissencephaly cases, the primary sulci would be unusually wide and flat while secondary sulci would be missing. At birth, lissencephaly with a head circumference of less than minus three standard deviations (< –3 SD) is considered microlissencephaly. Although genetic diagnosis in patients with MLIS is challenging, exome sequencing has been suggested to be a powerful diagnostic tool. In 1999, Dobyns and Barkovich suggested a classification of patients with severe microcephaly combined with gyral abnormalities including: microcephaly with simplified gyral pattern (MSGP), microlissencephaly and polymicrogyria. The classification divided those patients into ten groups in which MSGP represented the first four groups, microlissencephaly referred to the groups from 5-8 and polymicrogyria in the last two groups. In Dobyns-Barkovich classification, Dobyns-Barkovich type 6 is equivalent to Norman-Roberts syndrome (MLIS1) while Dobyns-Barkovich type 8 corresponds to Barth microlissencephaly syndrome (MLIS2). Microlissencephaly is considered a more severe form than microcephaly with simplified gyral pattern. Microlissencephaly is characterized by a smooth cortical surface (absent sulci and gyri) with a thickened cortex (> 3 mm) and is usually associated with other congenital anomalies. Microcephaly with a simplified gyral pattern has too few sulci and normal cortical thickness (3 mm) and is usually an isolated anomaly. Microlissencephaly usually leads to an early fatal outcome during the neonatal period. Microlissencephaly is listed in Orphanet database as a rare disease. There is no much information available about the epidemiology of microlissencepahly in literature. A PhD thesis has estimated the prevalence of microlissencepahly in South–Eastern Hungary between July 1992 and June 2006 to be a case every 91,000 live births (0.11:10,000). In 1976, the first syndrome with MLIS was reported, now known as Norman–Roberts syndrome (MLIS type A). The Barth type (MLIS type B) was for the first time described in 1982 in two siblings who died soon after birth. ^ Barkovich, A.; Ferriero, Donna; Barr, R.; Gressens, P.; Dobyns, W.; Truwit, Ch. ; Evrard, Ph. (1998). "Microlissencephaly: A Heterogeneous Malformation of Cortical Development". Neuropediatrics. 29 (3): 113–119. doi:10.1055/s-2007-973545. ISSN 0174-304X. PMID 9706619. ^ a b c Razek, A. A. K. Abdel; Kandell, A. Y.; Elsorogy, L. G.; Elmongy, A.; Basett, A. A. (2009-01-01). "Disorders of Cortical Formation: MR Imaging Features". American Journal of Neuroradiology. 30 (1): 4–11. doi:10.3174/ajnr.A1223. ISSN 0195-6108. PMID 18687750. ^ Cicuto Ferreira Rocha, Nelci Adriana; de Campos, Ana Carolina; Cicuto Ferreira Rocha, Fellipe; Pereira dos Santos Silva, Fernanda (2017-11-01). "Microcephaly and Zika virus: Neuroradiological aspects, clinical findings and a proposed framework for early evaluation of child development". Infant Behavior and Development. 49 (Supplement C): 70–82. doi:10.1016/j.infbeh.2017.07.002. PMID 28755567. ^ Hutton, Chloe; De Vita, Enrico; Ashburner, John; Deichmann, Ralf; Turner, Robert (2008-05-01). "Voxel-based cortical thickness measurements in MRI". NeuroImage. 40 (4): 1701–1710. doi:10.1016/j.neuroimage.2008.01.027. ISSN 1053-8119. PMC 2330066. PMID 18325790. ^ Swaiman, Kenneth F.; Ashwal, Stephen; Ferriero, Donna M.; Schor, Nina F. (2011-11-11). Swaiman's Pediatric Neurology - E-Book: Principles and Practice. Elsevier Health Sciences. ISBN 978-0323089111. ^ Gaitanis, John N.; Walsh, Christopher A. (May 2004). "Genetics of disorders of cortical development". Neuroimaging Clinics of North America. 14 (2): 219–229, viii. doi:10.1016/j.nic.2004.03.007. ISSN 1052-5149. PMID 15182816. ^ a b c Martin, Richard J.; Fanaroff, Avroy A.; Walsh, Michele C. (2014-08-20). Fanaroff and Martin's Neonatal-Perinatal Medicine E-Book: Diseases of the Fetus and Infant. Elsevier Health Sciences. ISBN 9780323295376. ^ a b Verloes, Alain; Drunat, Séverine; Gressens, Pierre; Passemard, Sandrine (1993). Adam, Margaret P.; Ardinger, Holly H.; Pagon, Roberta A.; Wallace, Stephanie E.; Bean, Lora JH; Mefford, Heather C.; Stephens, Karen; Amemiya, Anne; Ledbetter, Nikki (eds.). GeneReviews(®). Seattle (WA): University of Washington, Seattle. PMID 20301772. ^ Kumar, Suresh; Suthar, Renu; Panigrahi, Inusha; Marwaha, Ram Kumar (2013-11-01). "Lissencephaly presenting with congenital hypothyroidism". Journal of Pediatric Endocrinology and Metabolism. 26 (11–12): 1175–7. doi:10.1515/jpem-2013-0102. ISSN 2191-0251. PMID 23751382. ^ Martin, Richard J.; Fanaroff, Avroy A.; Walsh, Michele C. (2014-08-20). Fanaroff and Martin's Neonatal-Perinatal Medicine E-Book: Diseases of the Fetus and Infant. Elsevier Health Sciences. ISBN 9780323295376. ^ Ashwal, Stephen; Michelson, David; Plawner, Lauren; Dobyns, William B. (2009-09-15). "Practice Parameter: Evaluation of the child with microcephaly (an evidence-based review)". Neurology. 73 (11): 887–897. doi:10.1212/WNL.0b013e3181b783f7. ISSN 0028-3878. PMC 2744281. PMID 19752457. ^ Verloes, A.; Elmaleh, M.; Gonzales, M.; Laquerrière, A.; Gressens, P. (2007-05-01). "Lissencéphalies : aspects cliniques et génétiques". Revue Neurologique. 163 (5): 533–547. doi:10.1016/S0035-3787(07)90460-9. ^ "Malformations of Cortical Development". Clinical Gate. 2015-04-12. Retrieved 2017-11-12. ^ a b Kroon, A.; Smit, B.; Barth, P.; Hennekam, R. (October 1996). "Lissencephaly with Extreme Cerebral and Cerebellar Hypoplasia. A Magnetic Resonance Imaging Study". Neuropediatrics. 27 (5): 273–276. doi:10.1055/s-2007-973778. ISSN 0174-304X. PMID 8971750. ^ a b RESERVED, INSERM US14 -- ALL RIGHTS. "Orphanet: Microlissencephaly". www.orpha.net. Retrieved 2017-11-15. ^ a b c d Coley, Brian D. (2013-05-21). Caffey's Pediatric Diagnostic Imaging E-Book. Elsevier Health Sciences. ISBN 978-1455753604. ^ Govaert, Paul; Vries, Linda S. de (2010-08-23). An Atlas of Neonatal Brain Sonography: (CDM 182-183). John Wiley & Sons. ISBN 9781898683568. ^ Klinge, L.; Schaper, J.; Wieczorek, D.; Voit, T. (2002). "Microlissencephaly in Microcephalic Osteodysplastic Primordial Dwarfism: A Case Report and Review of the Literature". Neuropediatrics. 33 (6): 309–313. doi:10.1055/s-2002-37086. ISSN 0174-304X. PMID 12571786. ^ Abdel-Salam, Ghada M.H. ; Abdel-Hamid, Mohamed S.; Saleem, Sahar N.; Ahmed, Mahmoud K.H. ; Issa, Mahmoud; Effat, Laila K.; Kayed, Hisham F.; Zaki, Maha S.; Gaber, Khaled R. (2012-08-01). "Profound microcephaly, primordial dwarfism with developmental brain malformations: A new syndrome". American Journal of Medical Genetics Part A. 158A (8): 1823–1831. doi:10.1002/ajmg.a.35480. ISSN 1552-4833. PMID 22786707. ^ a b Cavallin, Mara; Rujano, Maria A.; Bednarek, Nathalie; Medina-Cano, Daniel; Bernabe Gelot, Antoinette; Drunat, Severine; Maillard, Camille; Garfa-Traore, Meriem; Bole, Christine (2017-10-01). "WDR81 mutations cause extreme microcephaly and impair mitotic progression in human fibroblasts and Drosophila neural stem cells". Brain: A Journal of Neurology. 140 (10): 2597–2609. doi:10.1093/brain/awx218. ISSN 1460-2156. PMID 28969387. ^ Harding, Brian N.; Moccia, Amanda; Drunat, Séverine; Soukarieh, Omar; Tubeuf, Hélène; Chitty, Lyn S.; Verloes, Alain; Gressens, Pierre; El Ghouzzi, Vincent (2016-08-04). "Mutations in Citron Kinase Cause Recessive Microlissencephaly with Multinucleated Neurons". The American Journal of Human Genetics. 99 (2): 511–520. doi:10.1016/j.ajhg.2016.07.003. ISSN 0002-9297. PMC 4974106. PMID 27453579. ^ Fallet-Bianco, Catherine; Laquerrière, Annie; Poirier, Karine; Razavi, Ferechte; Guimiot, Fabien; Dias, Patricia; Loeuillet, Laurence; Lascelles, Karine; Beldjord, Cherif (2014-07-25). "Mutations in tubulin genes are frequent causes of various foetal malformations of cortical development including microlissencephaly". Acta Neuropathologica Communications. 2: 69. doi:10.1186/2051-5960-2-69. ISSN 2051-5960. PMC 4222268. PMID 25059107. ^ "t(5;16)(q32;p13) NDE1/PDGFRB". atlasgeneticsoncology.org. Retrieved 2017-11-07. ^ Houlihan, Shauna L; Feng, Yuanyi (2014-09-23). "The scaffold protein Nde1 safeguards the brain genome during S phase of early neural progenitor differentiation". eLife. 3: e03297. doi:10.7554/eLife.03297. ISSN 2050-084X. PMC 4170211. PMID 25245017. ^ Bakircioglu, Mehmet; Carvalho, Ofélia P.; Khurshid, Maryam; Cox, James J.; Tuysuz, Beyhan; Barak, Tanyeri; Yilmaz, Saliha; Caglayan, Okay; Dincer, Alp (2011-05-13). "The Essential Role of Centrosomal NDE1 in Human Cerebral Cortex Neurogenesis". American Journal of Human Genetics. 88 (5): 523–535. doi:10.1016/j.ajhg.2011.03.019. ISSN 0002-9297. PMC 3146716. PMID 21529752. ^ Liu, Joan Y. W.; Kasperavičiūtė, Dalia; Martinian, Lillian; Thom, Maria; Sisodiya, Sanjay M. (2012-04-16). "Neuropathology of 16p13.11 Deletion in Epilepsy". PLOS ONE. 7 (4): e34813. doi:10.1371/journal.pone.0034813. ISSN 1932-6203. PMC 3327721. PMID 22523559. ^ Yigit, Gökhan; Wieczorek, Dagmar; Bögershausen, Nina; Beleggia, Filippo; Möller-Hartmann, Claudia; Altmüller, Janine; Thiele, Holger; Nürnberg, Peter; Wollnik, Bernd (2016-03-01). "A syndrome of microcephaly, short stature, polysyndactyly, and dental anomalies caused by a homozygous KATNB1 mutation". American Journal of Medical Genetics Part A. 170 (3): 728–733. doi:10.1002/ajmg.a.37484. ISSN 1552-4833. PMID 26640080. ^ a b c Poirier, Karine; Martinovic, Jelena; Laquerrière, Annie; Cavallin, Mara; Fallet-Bianco, Catherine; Desguerre, Isabelle; Valence, Stephanie; Grande-Goburghun, Jocelyne; Francannet, Christine (2015-08-01). "Rare ACTG1 variants in fetal microlissencephaly". European Journal of Medical Genetics. 58 (8): 416–418. doi:10.1016/j.ejmg.2015.06.006. PMID 26188271. ^ Young, Fraser I.; Keruzore, Marc; Nan, Xinsheng; Gennet, Nicole; Bellefroid, Eric J.; Li, Meng (2017-07-11). "The doublesex-related Dmrta2 safeguards neural progenitor maintenance involving transcriptional regulation of Hes1". Proceedings of the National Academy of Sciences. 114 (28): E5599–E5607. doi:10.1073/pnas.1705186114. ISSN 0027-8424. PMC 5514752. PMID 28655839. ^ a b Bahi-Buisson, Nadia; Cavallin, Mara (1993). "Tubulinopathies Overview". In Adam, Margaret P.; Ardinger, Holly H.; Pagon, Roberta A.; Wallace, Stephanie E.; Bean, Lora JH; Mefford, Heather C.; Stephens, Karen; Amemiya, Anne; Ledbetter, Nikki (eds.). GeneReviews(®). Seattle (WA): University of Washington, Seattle. PMID 27010057. ^ Chang, Bernard S. (2015). "Tubulinopathies and Their Brain Malformation Syndromes: Every TUB on Its Own Bottom". Epilepsy Currents. 15 (2): 65–67. doi:10.5698/1535-7597-15.2.65. ISSN 1535-7597. PMC 4519017. PMID 26251641. ^ Chakraborti, Soumyananda; Natarajan, Kathiresan; Curiel, Julian; Janke, Carsten; Liu, Judy (October 2016). "The emerging role of the tubulin code: From the tubulin molecule to neuronal function and disease". Cytoskeleton. 73 (10): 521–550. doi:10.1002/cm.21290. ISSN 1949-3592. PMID 26934450. ^ Sweet, Kevin M.; Shaw, Dennis W. W.; Chapman, Teresa (2017-06-01). "Cerebral palsy and seizures in a child with tubulinopathy pattern dysgenesis and focal cortical dysplasia". Radiology Case Reports. 12 (2): 396–400. doi:10.1016/j.radcr.2016.12.008. PMC 5417618. PMID 28491196. ^ Salomon, L. J.; Garel, C. (December 2007). "Magnetic resonance imaging examination of the fetal brain". Ultrasound in Obstetrics & Gynecology. 30 (7): 1019–1032. doi:10.1002/uog.5176. ISSN 0960-7692. PMID 17994613. ^ Gembruch, Ulrich; Hecher, Kurt; Steiner, Horst (2013-10-30). Ultraschalldiagnostik in Geburtshilfe und Gynäkologie (in German). Springer-Verlag. ISBN 9783642296338. ^ Kato, Mitsuhiro (2015-05-21). "Genotype-phenotype correlation in neuronal migration disorders and cortical dysplasias". Frontiers in Neuroscience. 9: 181. doi:10.3389/fnins.2015.00181. ISSN 1662-4548. PMC 4439546. PMID 26052266. ^ a b Dobyns, W.; Barkovich, A. (1999). "Microcephaly with Simplified Gyral Pattern (Oligogyric Microcephaly) and Microlissencephaly". Neuropediatrics. 30 (2): 104–106. doi:10.1055/s-2007-973471. ISSN 0174-304X. ^ Sztriha, L.; Dawodu, A.; Gururaj, A.; Johansen, J. G. (2004). "Microcephaly Associated with Abnormal Gyral Pattern". Neuropediatrics. 35 (6): 346–352. doi:10.1055/s-2004-830430. ISSN 0174-304X. PMID 15627942. ^ Szabó, Dr. Nóra (9 May 2012). Epidemiology of central nervous system malformations in South-Eastern Hungary (PhD thesis). University of Szeged. Retrieved 15 Nov 2017. ^ Norman, M. G.; Roberts, M.; Sirois, J.; Tremblay, L. J. (February 1976). "Lissencephaly". The Canadian Journal of Neurological Sciences. 3 (1): 39–46. ISSN 0317-1671. PMID 175907.